Keep Stone Beautiful. Prevent Entrapped Moisture. Modern thin stone wall assemblies don't dry like they used to. Newer building materials (like OSB, plastic WRBs) and methods (air sealing, increased insulation, vapor control) reduce the wall’s drying capacity and in turn, increase the risk of entrapped moisture. Surfactants in the adhering mortar compromise the water repellency of many WRBs. Creating a continuous, predictable air gap between the scratch coat and the WRB with a rainscreen drainage mat improves the ability of the wall to drain and dry. The air gap enhances the performance of the WRB by eliminating hydrostatic pressure, mitigating risk from fastener penetrations. Building in the hot-humid southeast? (Climate zones 1A-3A)? 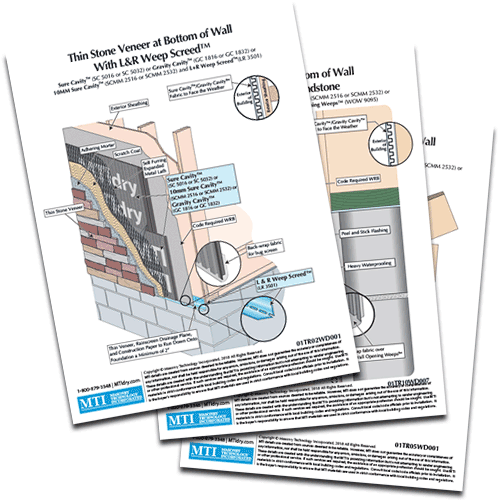 Learn about changes to building codes in the 2018 IBC for adhered masonry. 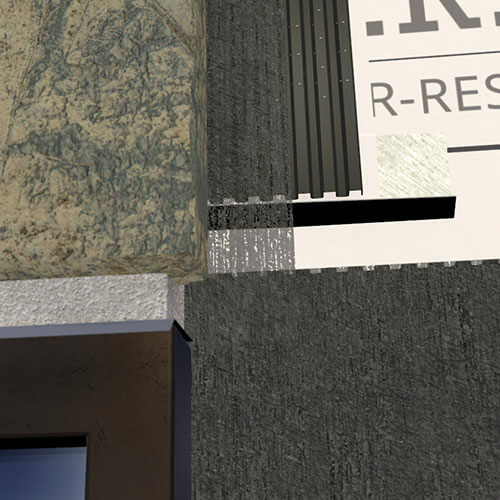 The EIFS industry recognizes that continuous rigid insulation is not a perfect barrier system, and as a result relies on a drainage gap between the foam and the water resistive barrier to drain liquid. A 1/8 inch air gap creates a capillary break to drain liquid water and limits thermal loss. Thin stone detailing with continuous rigid insulation take cues from EIFS by having an air gap to drain behind the rigid insulation. A second draining layer immediately behind the thin stone is advantageous as well to quickly and evenly dry the thin stone, reducing efflorescence and cracking. An air gap prevents hydrostatic pressure in the wall assembly, lets gravity drain liquid moisture, and allows water vapor to exit at ventilated terminations. 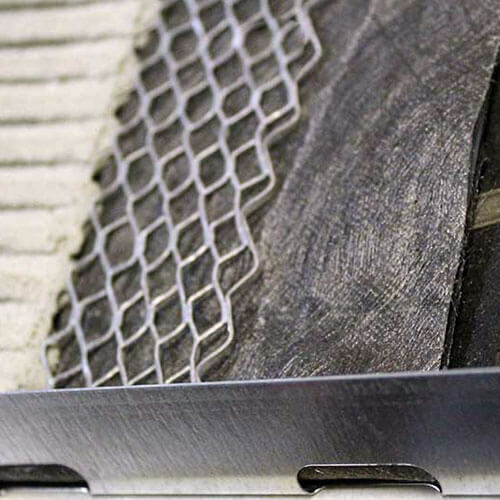 Sure Cavity™'s rigid channels and mortar blocking fabric ensure a clear and continuous drainage gap along the entire backup wall. Sure Cavity lays flat on the sheathing to create an even surface for the stone installation. In the lab and on the jobsite, Sure Cavity rapidly drains and dries walls. Gravity drains liquid water to the weep screed at the bottom of the wall, and then it needs to escape. 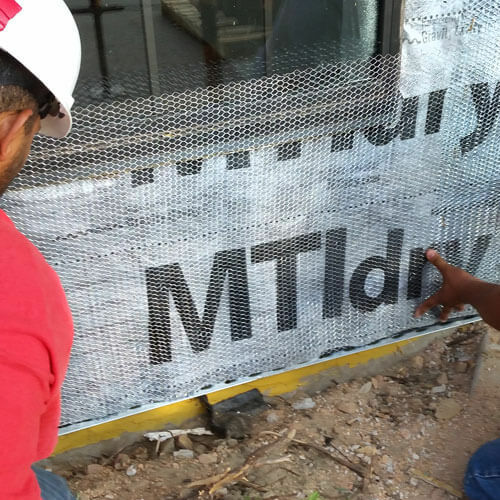 The L & R Weep Screed™ from MTI is the only rainscreen compatible weep screed on the market, with large slots for drainage immediately below the Sure Cavity™ rainscreen. The L & R Weep Screed allows you to create a ventilated rain screen assembly for maximum drying power to keep your walls dry and safe for generations. Weeps aren't just for brick veneers - thin stone needs a path to drain too. 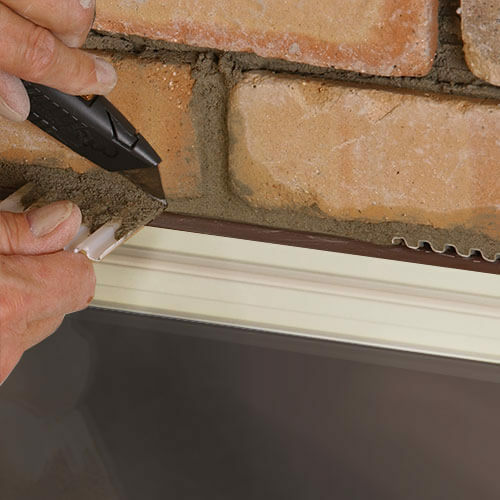 Wall Opening Weeps™ create pathways to drain directly on the flashing above windows and in run-to-grade applications. Each Wall Opening Weep creates 5 weep tunnels directly on the flashing to keep your walls dry. Window rough openings are a common weak spot for moisture problems - but if the rough openings don't get wet problems are prevented. The Moisture Diverter™ channels water in the rainscreen drainage plane away from the rough opening to reduce the potential for leaks and keep windows dry.